There’s no shortage of doom and gloom talk about a US housing crash that would take NYC down with it. In fact the recent reports of high foreclosure rates in Queens, Bronx and Staten Island are a little alarming. They’re not quite as negative though as those in other cities. According to REBNY, the average resale home price in New York City during the last 3 months of 2018 was $938,000. That represents a 2% rise from the fourth quarter of 2017. Average price in the Bronx rose 12% to $472,000 in the fourth quarter of 2018 up $50,000 from $422,000 in the last quarter of 2017. Total sales amounted to $10.3 billion in the fourth quarter of 2018, down 3% from same period in 2017. This marks the 6th consecutive quarter of year-over-year declines in total residential sales. NYC home sales volume fell 5% to 11,063 in the 4th quarter of 2018 compared to last quarter 2017. Year-over-year, the total home sales in Manhattan fell 8% to 2,445 units. Home sales fell 5% to 2,527 in Brooklyn; down 6% to 3,701 in Queens; and down 5% to 1,030 units in the Bronx. With income averaging about $60,000 per year in New York City, it’s difficult for many to buy homes averaging $938,000. It’s estimated that to buy a home in NYC, you need an income of $100,000+. This chart below from the Case Shiller Home price index shows NYC’s real estate is stable and optimistic. The telling statistic is almost record low housing availability combined with record low affordability. There are 60,501 homes for sale in New York State. 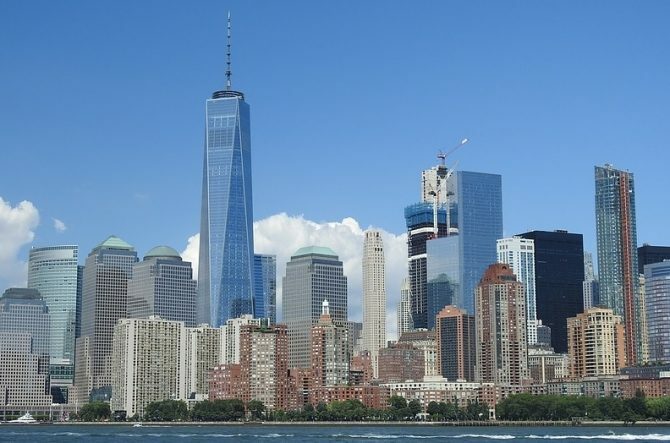 You could say that just like the San Francisco market and Los Angeles market, and all major city markets acorss North America, the New York housing market is under pressure. The NYC forecast is for more of the same, but at least, the market here isn’t like it is in Seattle, the Bay Area, or Los Angeles county. It’s pretty far fetched that New York’s real estate performance could deviate too much from the US national forecast. A crash isn’t favored by the stats. Is 2018 the right year to invest in rental income property? Contrast the stock market to investing in real estate. Looking for a lower quote on New York Car Insurance. Find out how you can save on auto insurance and save thousands of dollars on your next policy. It’s time to switch insurance companies to get the rate you deserve. The Best of NY Auto insurance companies want your business. There are enough media and realty pundits talking about a real estate market crash in New York soon. CNBC called from one back in the spring, but it’s not happening. Prices in Manhattan, Brooklyn, Queens, have kept rising slowly. It’s softening in the high end luxury sector where DOM is lengthening and prices have dropped almost 1% during 2016 according to one report. But demand at the lower end has stayed strong. 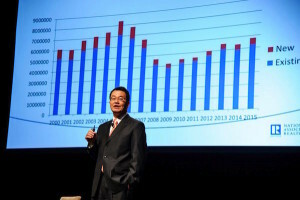 NYSAR reiterated NAR Chief Economist Lawrence Yun’s keynote speech at the 2016 REALTORS® Conference & Expo in Orlando, Florida. Yun explained that younger buyers are likely to drive growth in residential markets in the years ahead as the economy stays on a positive track and interest rates stay relatively low. Here’s the 3rd quarter market report from NYSAR. New listings are down from the previous quarter, avg/med prices are up and number of months supply has dropped 29%. 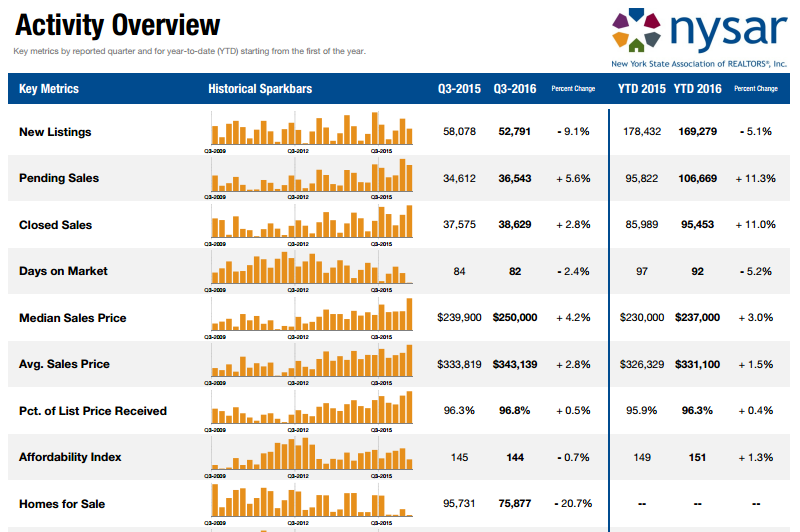 The year-to-date (Jan. 1 – Sept. 30) sales total of 95,453 was 11% above the same period last year. There were 38,629 closed sales in the 2016 third quarter, up 2.8% from the 2016 third quarter total of 37,575. September 2016 closed sales increased 2.1%compared to a year ago to reach 11,780. Calls for $127.5 Billion in Total Spending Through 2018. 2016 was a record year for housing sales and jumped past the $40 billion mark for the first time. 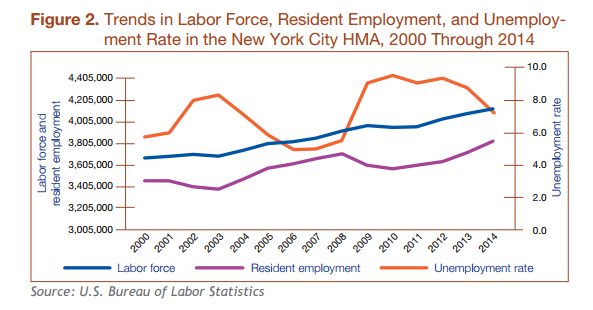 NYBC also forecasts a total of 147,100 jobs in NY’s 5 boroughs in 2016, an increase of 8,900 jobs from 2015 but will fall a few percent to 142,600 jobs in 2017 and 138,100 in 2018. These screen caps are from HUD’s Comprehensive Housing Market Analytis of New York City, NY. New York’s economy was rolling along nicely. 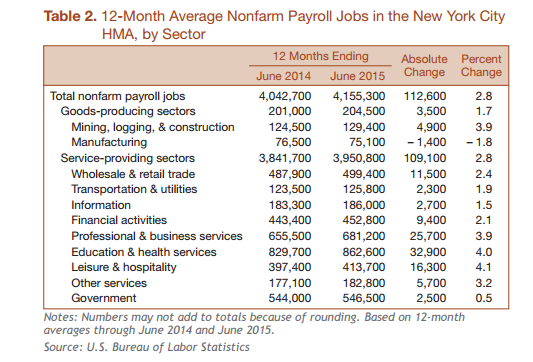 Is that forecasted softening in employment enough to cause a crash? The Building Congress’s outlook for new home construction is 27,000 new units and $13.1 billion of residential spending in 2017, and 25,000 units and $12.7 billion in spending in 2018. That’s down significantly from the 36,000 units built in 2015. With nowhere to live we can expect residents new and old to bid on resale stock and that should keep home prices level. Donald Trump did make an election promise to cut government spending and tax the wealthy and that could make an impact, yet it appears private demand is what is driving the economy right now. Removal of the Dodd Frank noose and easing of mortgage lending should create more demand for homes in New York, Los Angeles, Boston, Seattle, Houston, SF Bay Area, Miami, and well, every US city. If land development regulations are eased, it will allow for more home construction and help to ease the auctions atmosphere that has rocketed them upward. It’s a health forecast with strong demand, stable mortgage rates, looser rules on financing, and a government bent on creating jobs in 2018 to 2020. Full speed ahead. 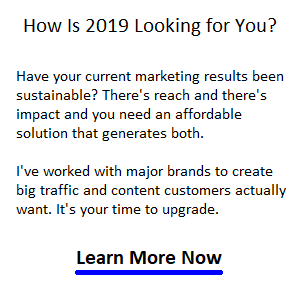 Gord Collins — I do cool marketing stuff like content reverse engineering, impact blogging, semantic SEO for realtors, and insurance companies in Los Angeles, Phoenix, San Diego, San Francisco, Miami, Boston, New York, Chicago, Toronto, Seattle, Denver, and Chicago.